Flipping balls gets you forearms. And probably the quickest way to carpal tunnel syndrome. Click above to Listen to my interview with Harry Hawk! THIS IS THE VIDEO THAT STARTED IT ALL! tAKONY STARRING CHEF KARL PALMA AS MANAGER OF OTAFUKU ON 9TH sTREET IN EAST VILLAGE, NYC FROM 2012!!! ​ON nhk/BS1 JAPAN NEWS 2017!!! "Karl Palma is a passionate cook and held the General manager and Head Chef position at East Village's Otafuku from January 2012 to June 2013 . Karl cooked at the Food Film Festival NYC, Chicago and Charleston, and starred IN A FOOD DOCUMENTARY CALLED TAKO NY, DIRECTED BY KRIS BEARTON. HE Has ALSO BEEN featured on the Cooking Channel as well as various food blogs. 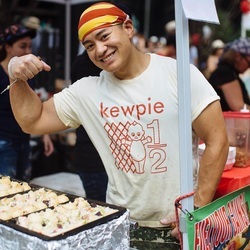 In January 2015, Karl launched Karl's Balls, starting with a pop-up at Openhouse on Bowery St, and then taking part at the grand opening of the Queens International Night Market in Flushing in April 2015. Using fresh ingredients, homemade recipes and small batch sauces, karl looks forward to bringing the best cooking for all of you to enjoy. dude, whaSSup with the banner??? Karl being Karl, HE loves a lot of different things. Food, music, drumming, bodybuilding, cartoons and weightlifting. One of his favorite bodybuilders was a man named Sergio Oliva from Cuba. The dude had arms bigger than his head and was famous for his myth like proportions. HE also DEFEATED ARNOLD. SERGIO was an inspiration. KARL WANTED TO CREATE SOMETHING EPIC, WINNING, FUN AND LIGHTHEARTED. Long story short, HE DECIDED to create a FUNNY Logo combining the cartoon LOGO of his favorite multi-vitamin, Russian Bear (See picS) with Sergio's Victory Pose -- paste his head on a the character and BOOM! Victory man was born.